The Lake Country Microfiber Cutting Pads help you remove light to heavy imperfections safely and easily. Years ago you may have to do many polishing steps that took nearly all day, but improved buffing pads like this one have changed the game! In just one to two steps you can restore a daily driver to like new condition. Pair this cutting pad with your favorite medium to heavy cutting polish and you should see incredible results. 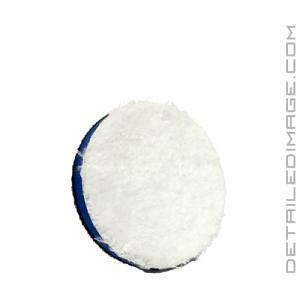 These outstanding results are possible because Lake Country Microfiber Cutting Pads feature a unique microfiber material, that is packed into a 11mm thick pad backed with sturdy foam. The pad has both a thin profile and forgiving cushion, which increases durability and offers ideal rotation on contoured surfaces. The fibers on the face of this pad have minimal overhang and mat down less quickly, which reduces operating temperature, increasing overall polishing results. In only a few passes, you will remove medium to heavy imperfections while leaving behind a nice glossy finish. On some darker colored paint you may leave behind haze and in these cases, we recommend following up with a lighter pad and polish combo. Pick yourself up some Lake Country Microfiber Cutting Pads and make quick work of imperfections today! Awesome little pads. They don't seem to have as good of a cut as the meguiars microfiber pads, but they finish out much better. These are my favorite pads to pair with my Rupes mini. Quality designed pads meant to last. They cut very well and can remove scratches left after wet sanding (3000 grit). If one properly maintains these pads, they will last awhile before having to discard and replace. Thank you Detailed Image for an amazing buying experience. I WILL be buying from you again!